The Campfire Community Cash Fund – More Locations Added! The businesses of Murphys in partnership with the Angels-Murphys Rotary Club are raising funds for communities impacted by the Camp Fire in Butte County. 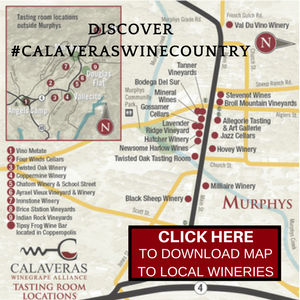 Drop off cash, checks or gift cards at the Native Sons Hall during Open House or at Gold Country Roasters, SNAC, Marisolio, The Spice Tin, Creative Cookware, Sustenance Books, Murphys Pourhouse, Milliaire Winery, Tanner Winery, Brice Station Vineyards, Next! 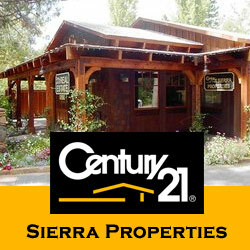 Upscale Resale, Broll Mountain Vineyards, Murphys Village Toy Store, Murphys Hotel Front Desk, Black Sheep Winery, Twisted Oak Winery Vallecito, Twisted Oak Winery Murphys, Firewood, Intelligent Yoga, and Re/Max Gold Murphys Realtor Leanne Smith, and the Calaveras Visitors Center through the end of the year. Additional businesses are joining the effort every day so keep your eyes open and give generously. Additional boxes have been added at the following businesses: Sac on Main Handbags & More, Murphys Grille, Jan & Jean Boutique, Murphys Irish Pub, The Lucky Penny Public House and V’Dora. 100% of donations collected by the Camp Fire Community Cash Fund will be distributed to Paradise and surrounding communities thanks to the Angels-Murphys Rotary Club and Paradise Rotary Club. Every little bit helps. While donations of goods are greatly appreciated, what the community groups need now is cold hard cash so they can help meet the evolving needs of the many people displaced by the fire. 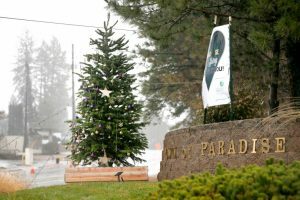 Let’s help Paradise get back on its feet! Thank you to Tonja Peterson and Sabrina Julian who have taken the lead on getting this project started. Additional thanks to Gateway Press and our local media for their support. 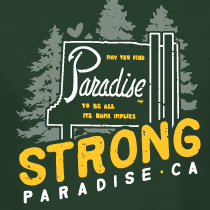 The Paradise Strong image shown with this post is available on t-shirts and sweatshirts from Custom Ink. 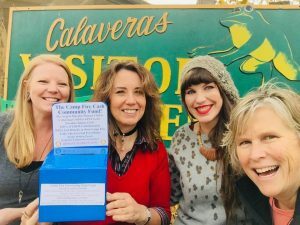 All funds raised go to the North Valley Community Foundation’s Camp Fire Evacuation Relief Fund.